All homes are different-- from the style, material, and color, to the location -- and yet there are also plenty of similarities. One similarity that every home shares is its potential to have high radon levels. Whether a home is young or old, radon can enter and build up to unhealthy amounts, making a home seemingly dangerous. Innovative Basement Systems is a trusted member of the nationally recognized National Radon Defense network, and they have the training and experience to help lower the radon levels in local homes. 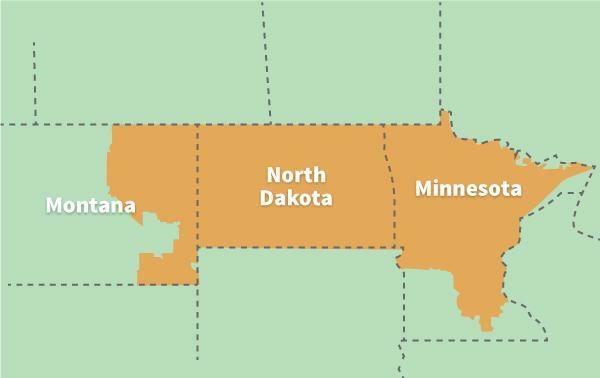 Our services are available in Minneapolis, St. Paul, Fargo, Bismarck and throughout Minnesota, North Dakota & Eastern Montana. Contact us today for more information about radon testing and radon mitigation in Minnesota, North Dakota and Eastern Montana. Whether the levels are above or below 4.0 pCi/L, Innovative Basement Systems can mitigate and reduce a home's levels to the lowest level. Innovative Basement Systems provides proper maintenance in order to check on the home and assure that the mitigation is effective. If you're considering having a home built, radon can still become a future problem. Radon is more expensive to repair later than to mitigate from the start. Ask the builder to install a radon resistant system as your home is being constructed. According to the National Association of Home Builders, one in six homes is being built with these systems. This means 200,000 homeowners are taking the initiative to protect their families before a home is even built. This is a worthwhile investment and a viable option. Innovative Basement Systems is the local radon mitigation expert in Bismarck, Saint Cloud, Eden Prairie, Grand Forks, Minot, Anoka, Andover and can thoroughly explain additional radon facts and the importance of understanding radon levels in a home. Contact Innovative Basement Systems today to learn more!